Hopes have been renewed that a permanent deal may finally be reached between the new government and holdout militias. Democratic icon and National League for Democracy (NLD) leader Aung San Suu Kyi has reached out to some of the oldest ethnic rebel groups in Myanmar. Her goal is clear: she wants to push for a wide-ranging peace accord with all insurgent groups, including those that refused to participate with the previous government. Friction between minority groups and the government have been ongoing for decades. Myanmar is one of the most ethnically and religiously diverse countries in Asia. While the majority of the population is the Burman (Bamar) ethnic group making up an estimated 68 percent of the population, the remaining 32 of the population comprises a number of different groups, including the Shan (9 percent), Kayin (7 percent), Rakhine (3.5 percent), Chinese (2.5 percent), Mon (2 percent), Kachin (1.5 percent), Indians (1.25 percent), and Kayah (0.75 percent). The tensions and antagonism are attributed to this heterogeneous composition. Myanmar’s ethnic groups are divided in terms of religion, language, and ideology, as well as being separated geographically. The British rulers tried to unite the variant ethnic groups before officially pulling out in 1947. Suu Kyi’s father, General Aung San, was a respected military leader who worked to unite various groups across the country for a democratic reform. However, the Communist Party of Burma led firefights against some ethnic groups to maintain territorial control and a monopoly of power. As a result, many ethnic groups picked up arms to safeguard their states from majority rule. These ethnic rebel groups are located in remote parts of the country that do not receive sufficient international attention and are often simply labeled as “rebel armies” without any understanding the nuances of the situation. Almost all ethnic groups have their own armies, which they have been using to protect their people and push for fundamental rights within their territory. The Karen National Liberation Army (KNLA), one of the oldest rebel groups in the world, have demanded autonomy and ethnic rights for the Karen people since 1949. In 1961, the Kachin rebels formed the Kachin Independence Army (KIA), the military wing of the Kachin Independence Organization (KIO). Many rebel groups have complained about the unrestrained force used by the state army. Around 3,700 villages have been destroyed in eastern Myanmar in the past 15 years. Each tribe wants to protect its individual languages, customs, roots, and natural resources. Some ethnic groups have historical ties to China. The Kokang, who are ethnic Han, speak Mandarin and their militia leader, Phone Kyar Shin, lived in China for years. The United Wa State Army, which controls one of the largest holdout territories in Myanmar, reportedly has Chinese backing too. They use the Chinese currency and have named Mandarin an official language. The previous government, under the leadership of Prime Minister Thein Sein, pushed for a ceasefire with some holdout militias in October 2015, but only eight of the 15 militant groups turned up to sign the proposal. The armed wings of the Kachin, Wa, and Shan refused to cooperate until all ethnic rebel groups agreed to be a part of the government’s initiative. However, the NLD’s accession into power marks signs of optimism for the country. People are hopeful that a permanent peace accord is possible, since many ethnic groups have welcomed the newly elected government and are willing to join renewed peace talks. 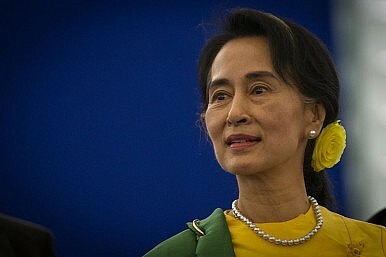 Suu Kyi’s vision of a peaceful reconciliation is similar to her late father’s. She wants to bring all ethnic groups together for a nonviolent means of reconciliation that will pave way for a democratic society. The Kachin and Karen rebels may trust Suu Kyi and the NLD’s vision of a peaceful reconciliation more the military junta and its political arm, National Unity Party (NUP). “We are eager to start peace talks,” La Nan, a spokesman of the Kachin Independent Army, was quoted as saying in an online article by Thailand’s Nation Multimedia. Other insurgent groups such as the United Wa State Army and the Shan State Army (SSA) have also welcomed the NLD’s triumphant victory and sent positive signals. Suu Kyi may take additional steps to reassure ethnic minorities that their vested interests will be represented in the NLD-led government for an inclusive and participative democracy.